In a distributed environment, failure of any given service is inevitable. Hystrix is a library designed to control the interactions between these distributed services providing greater latency and fault tolerance. Hystrix does this by isolating points of access between the services, stopping cascading failures across them, and providing fallback options, all of which improve the system’s overall resiliency. Hystrix evolved out of resilience engineering work that the Netflix API team began in 2011. Over the course of 2012, Hystrix continued to evolve and mature, eventually leading to adoption across many teams within Netflix. Today tens of billions of thread-isolated and hundreds of billions of semaphore-isolated calls are executed via Hystrix every day at Netflix and a dramatic improvement in uptime and resilience has been achieved through its use. Give protection from and control over latency and failure from dependencies (typically accessed over network) accessed via 3rd party client libraries. Enable near real-time monitoring, alerting and operational control. 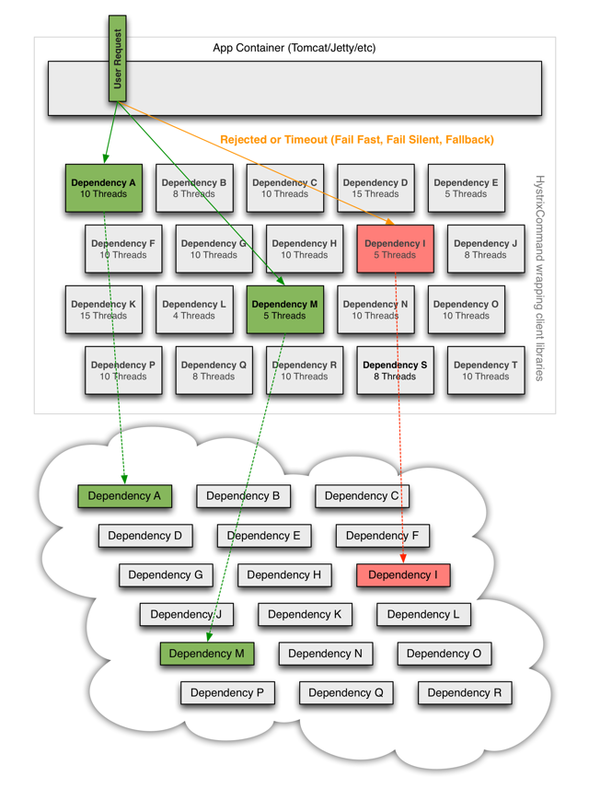 Applications in complex distributed architectures have dozens of dependencies, each of which will inevitably fail at some point. If not isolated from these external failures, the host application is at risk of being taken down with them. 99.9930 = 99.7% uptime 0.3% of 1 billion requests = 3,000,000 failures 2+ hours downtime/month even if all dependencies have excellent uptime. Even when all dependencies are performing well the aggregate impact of even 0.01% downtime on each of dozens of services equates to potentially hours a month of downtime if not engineered for resilience. With high volume traffic a single backend dependency becoming latent can cause all resources to become saturated in seconds on all servers. Every point in an application that reaches out over the network or into a client library that can potentially result in network requests is a source of failure. Worse than failures, these applications can also result in increased latencies between services which backs up queues, threads and other system resources causing even more cascading failures across the system. These issues are exacerbated when network access is performed through 3rd party clients which act as a "black box" where implementation details are hidden, can change at any time, and network or resource configurations are different for each client library and often difficult to monitor and change. 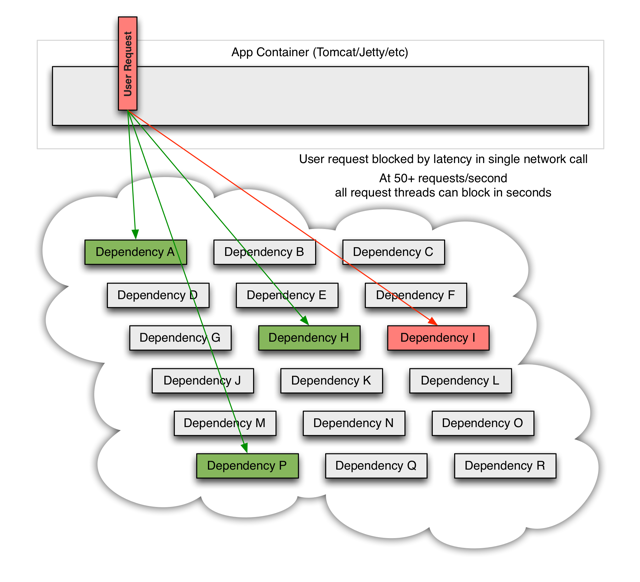 Even worse are transitive dependencies that get picked up and perform potentially expensive or fault-prone network calls without explicit invocation from the application. Network connections fail or degrade. Services and servers fail or become slow. New libraries or service deployments change behavior or performance characteristics. Client libraries have bugs. All of these represent failure and latency that needs to be isolated and managed so a single dependency failing can’t take down an entire application or system. 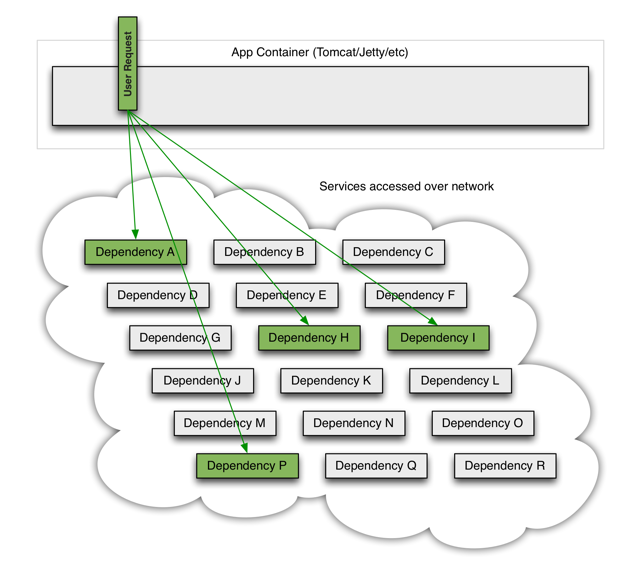 Restrict any single dependency from using up all container (such as Tomcat) user threads. Shed load and fail fast instead of queueing. Use isolation techniques (such as bulkhead, swimlane and circuit breaker patterns) to limit impact of any one dependency. Optimize for time-to-recovery with low latency propagation of configuration changes and support for dynamic property changes in virtually all aspects of Hystrix to allow real-time operational modifications with low latency feedback loops. 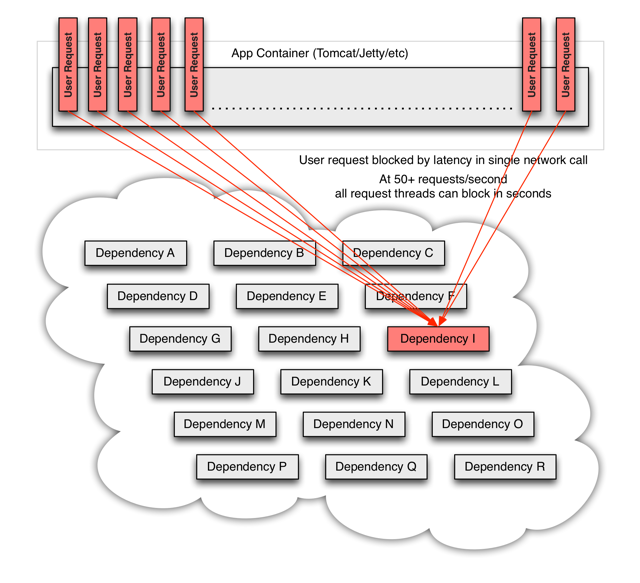 Protect against entire dependency client execution, not just network traffic. How does Hystrix accomplish this? Wrap all calls to external systems (dependencies) in a HystrixCommand object (command pattern) which typically executes within a separate thread. Time-out calls that take longer than defined thresholds. A default exists but for most dependencies is custom-set via properties to be just slightly higher than the measured 99.5th percentile performance for each dependency. Maintain a small thread-pool (or semaphore) for each dependency and if it becomes full commands will be immediately rejected instead of queued up. Measure success, failures (exceptions thrown by client), timeouts, and thread rejections. Trip a circuit-breaker automatically or manually to stop all requests to that service for a period of time if error percentage passes a threshold. Perform fallback logic when a request fails, is rejected, timed-out or short-circuited. Monitor metrics and configuration change in near real-time. Learn more about How It Works and How To Use.